I am living in Berlin for more than 10 years and know a few places. So I've collected some Hostels and reasonable priced hotels. Since taxi travels are expensive, I only picked locations who are near public transportation hubs around the Estrel. Starting point is the S-Bahn station Sonnenallee, which is directly next to the Estrel. ...located at S- and U-station Neukölln. Appr. 800 meters distance to the con hotel. You could even rent a bicycle or walk. Next level: Changing the train at Ostkreuz station and take any train you like, drive one station to the west and leave at Warschauer Str.. You are now in Berlin's party zone. Oh, lots of hostels, too. Your short-trip ticket allows changing trains, so this is no problem! Don't like the S-Bahn? You can also use the bus with the short-trip ticket. And using buses or trams, you can even ride 6 stations! Knowing this, you can use the Bus line M41 (operates 24/7) from Ziegrastr stop (directly at the tip of the Estrel pyramid) to Fuldastr. stop. Takes just 6-8 minutes. A little 100m walk through the Fuldastr. and you reach the Rixpack hostel. Maybe you prefer some more privacy? Berlin is full with Airbnb vacation homes. Also good to know: The S-Bahn doesn't operate in the nighttime during working days (Pause between 1 am and 5 am). Instead, there are buses who goes all 30 minutes. At weekend nights (Friday to Saturday and Saturday to Sunday) the S-Bahn and U-Bahn in Berlin operates 24h, with a train frequency of 15 minutes. Almost all hostels and hotels are offering bicycle rental, even the Estrel does. Ask for conditions, prices can vary! In spring 2016, Berlin's biggest youth hostel will open it's gates. The new official category IV (top notch) youth hostel will have 445 beds, every room equipped with shower and WC. It is located directly at Ostkreuz station and has almost direct access to the train platforms. ...one important thing is that the night bus lines have no relation to the S-Bahn whatsoever. In fact, most of them are destined to replace the U-Bahn trains (that's why the N7 runs through Neukölln and Britz, because it replaces the daytime U7 train). So if you plan to go anywhere "late at night" (1:00 really isn't -that- late after all), I can only advise to you to check out the night bus network beforehand (it's available here as a PDF file) unless you want to find yourself stuck in one of the less favourable districts of Berlin late at night. If you don't mind a half hour ride on the (24 hour) M41, there are some hotels around "Anhalter Bahnhof" with availability. As a rough guide, prices range from around 76€ to 99€ per room per night including breakfast, based on two people sharing. More specifically, the Crowne Plaza Berlin - Potsdamer Platz, Holiday Inn Express Berlin City Centre and ibis budget Berlin City Potsdamer Platz. There are a few other hotels nearby, but prices didn't show up when I looked earlier. 1) What is a "Youth Hostel"? 2) Can anyone - even those of us who are no longer "youths" - stay there? 3) In what ways is it different from a hotel (particularly one as luxurious as the Estrel)? A youth hostel is like a regular hostel but there is a youth hostel association in Germany, which is managing these. Anyone can book a room, which is usually shared with multiple people like in a regular hostel. A youth hostel is very basic, so sharing a room with multiple people, shared washing facilities in most cases and a general dining hall, where everyone can eat. Some offer breakfast, others offer only the accommodation, so very basic. Hope this helped to clear a few things up. In order to be offered accommodation in a Youth Hostel, you have to be a member of the DJH or of another association of the International Youth Hostel Federation (IYHF). Guests must provide proof of such membership before being given accommodation at the Youth Hostel. 2.1 DJH membership cards can be obtained by all persons with a permanent residence in the Federal Republic of Germany at all DJH membership card issuing offices (including at Youth Hostels and offices of the DJH Regional Associations). 2.3 Foreign guests who are not members of an IYHF-affiliated association can obtain the “International Guest Card” or a “Welcome Stamp” for every night directly at the Youth Hostel. An international guest who does not hold a membership card can purchase an International Guest Card in place of membership. He is required to buy a Welcome Stamp for each night of his stay at the cost of € 3.50. When he or she has collected 6 Welcome Stamps, the Guest Card becomes valid in all Hostels worldwide or entitles the holder to reduced rates for his stay. Validity is 12 months from the date of issue. Alternatively, a Guest Card with immediate international validity can be obtained at € 18.00. Hotel Britzer Tor, Karl-Marx-Str. 262. A bit south of S+U Neukölln, three stars, has twins for €71 and junior suite that sleeps four people for €104 a night. A bit more upmarket than the 2A, but pretty tiny. I'd like to remind you to take a look at the cancellation options/ fees of these hotels! If you are booking a room in the hope of still being admitted to the Estrel check that you don't have to pay too much for cancellation or choose an option with free cancellation. By the way, the Park Hotel Blub has been sold this year and is now called "Centro Park Hotel Berlin-Neukölln". The Generator is a large hostel with over 850 beds in rooms ranging from 1 to 14 beds, the Andel's is a 4-star hotel (similar to the Estrel) with 550 rooms and suites. The Vienna House Easy is a three-star boutique hotel with 155 rooms, directly opposite the Generator Hostel. All three are situated directly next to the S-Bahn station Landsberger Allee, which has fast and frequent connections to S Sonnenallee via the S42 and S41 trains (running every 10 minutes during the day, every 20 minutes in the evening). Rooms at the Andel's are between €70 and €90 per night for the period of EF. There is a small caveat to these two places, however. During weeknights, there is no train service between 01:20 and 04:20. There is a night bus / tram connection, but it takes an hour to get there (or 59 minutes, to be pedantic.) On weekends, i.e. the nights Friday/Saturday and Saturday/Sunday however, there are S-Bahn trains every 20 minutes throughout the night. It's literally a 200 meter walk from the Estrel, a few minutes on a train and a 100 meter walk from Landsberger Allee station. If you haven't booked a bed yet, give these two a consideration. Thanks! 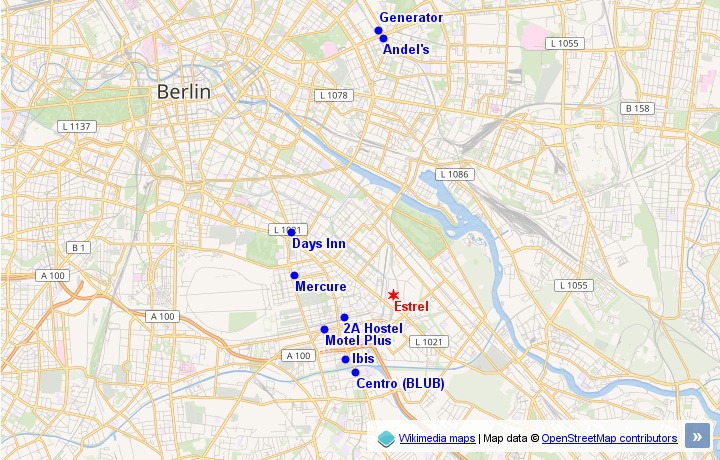 I've updated my interactive map at https://woelfisch.de/blog/eurofurence-overflow-hotels I mentioned above. Word of advice from a seasoned EF-er: The buses in Berlin are TERRIBLE, especially the M41. The last 2 times (EF21 and 22) when I journeyed into Neukolln on that bus, the inbound leg was fine but the return was 15+ minutes late and absolutely packed full of (loud, noisy, stinking) people. I will in the future only use the Bahn to get around the area, even if it means having to transfer between trains, and that's my advice to anyone else going beyond walking distance. The Bahn rarely keeps you waiting and doesn't get quite so crowded.